President Trump on Wednesday said the Federal Aviation Administration would ground Boeing Co.’s fleet of 737 MAX airliners, as the WSJ’s Andrew Tangel, Robert Wall and Alex Leary report. Having twice thrown out Prime Minister Theresa May’s plan for Britain’s withdrawal from the European Union, the fractious British Parliament on Wednesday also rejected the idea of a disorderly “no-deal” exit from the bloc. And, as the New York Times’ Stephen Castle reports, there is great uncertainty on next steps. Dive Deeper: “Political Chaos as May’s Brexit Plan Goes Down in Flames,” by the Atlantic Council’s John Roberts. A senior Iranian security official on Wednesday accused regional powers of spending money on “suspicious nuclear projects”, and warned that such threats would force Tehran to revise its defense strategy. Ali Shamkhani, the secretary of Iran’s Supreme National Security Council, did not name the countries - but a proposed transfer of U.S. nuclear technology to Saudi Arabia has raised concerns in Tehran, as Reuters’ reports. Dive Deeper: “War by Proxy: Iran’s Growing Footprint in the Middle East,” by CSIS’s Seth Jones. The United States is aiming to test a ground-launched cruise missile with a range of about 1,000 kilometers (621 miles) in August, a Pentagon official said on Wednesday, after Washington announced that it plans to withdraw from the Intermediate-Range Nuclear Forces Treaty, as Reuters’ Idrees Ali reports. Dive Deeper: Visit CSIS’s interactive “Missile Threat” micro-website. NATO as whole spends 15.5 times more on military forces than Russia, and NATO Europe alone spends 4 times as much. 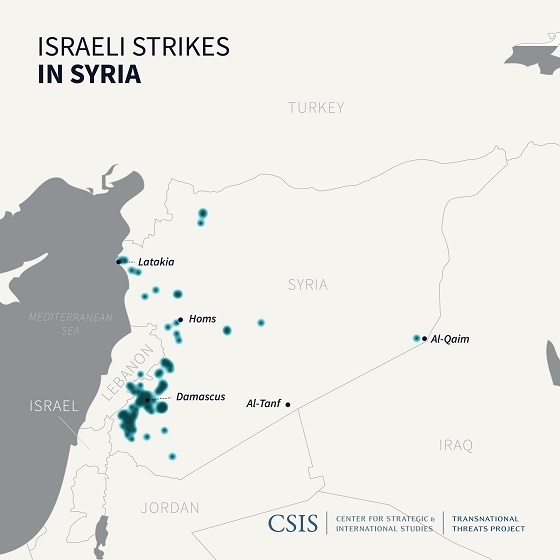 A new brief on Iran's Islamic Revolutionary Guards Corps-Quds Force (IRGC-QF) offers a database of Israeli attacks against targets in Syria, which provides a useful indicator of Iranian activity. (Photo credit: Frederick Florin/AFP/Getty Images). 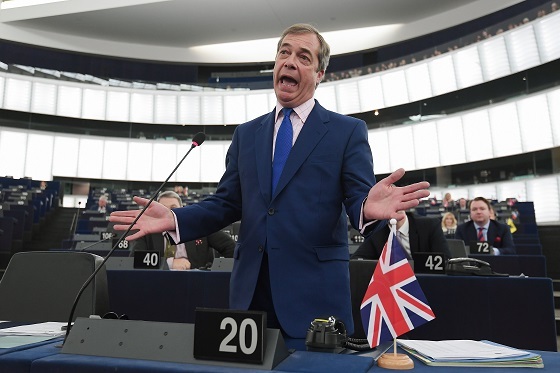 Nigel Farage gestures as he speaks during a debate on the preparation of the upcoming European Council meeting of March 21 and 22 and UK's withdrawal from the EU during a plenary session at the European Parliament. “How I Would Cover the College-Admissions Scandal as a Foreign Correspondent,” by the New Yorker’s Masha Gessen. Starting at 9:30 a.m., CSIS will host Dr. Kiron Skinner, Director of Policy Planning, U.S. Department of State, in a discussion on the approach of the Trump administration in stabilizing fragile states. Then at 12:15 p.m., the Council on Foreign Relations will hold a panel discussion on the importance of democracy in promoting global health. And finally, at 2:00 p.m., the Brookings Institute will host Undersecretary of the United States Army Ryan McCarthy for a discussion on the Army’s most recent budget proposal request and its future defense strategy. CSIS today held a book forum, discussing the IMF’s latest work titled The Future of China’s Bond Market. The Forum featured remarks by the book’s three authors, along with commentary from other experts. Watch the full event here. 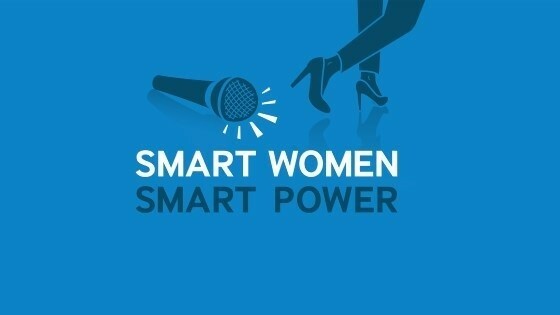 The Smart Women, Smart Power biweekly podcast features powerful, in-depth conversations with women leaders from around the globe who are experts in foreign policy, national security, international business, and international development.